dreams, raise your hand if you volunteer. Despite his officiating career ending in April, former NHL referee Kerry Fraser has been back in the public eye lately. 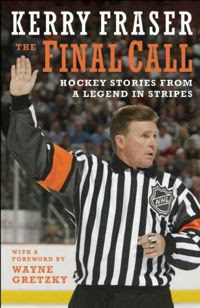 Fraser has been making the publicity rounds for his new book The Final Call, which details his 30 years as an official. As the league's all-time leader in games worked, Fraser has a treasure trove of stories and insights to share with fans. And while some fans still insist on focusing on a small handful of controversial moments in his career, the book goes well beyond those few isolated incidents. Fraser pulls no punches in describing the life of an official both on and off the ice, including several details that have never been discussed publicly. While my advanced copy of the book has mysteriously failed to arrive yet, various sources within the publishing industry have confirmed several explosive revelations. Apparently there was some sort of controversial call involving the Leafs and Kings a few years back, and it's sort of surprising that nobody ever brings that up anymore. Despite the paranoid fantasies of your childhood Fraser did not actually "hate" your favourite team or player, but instead hated you, personally. All NHL referees dread running into commissioner Gary Bettman, since they inevitably end up having to spend an hour explaining why they don't call travelling more often. According to an emotional passage on the first page, the entire book is dedicated to Bill McCreary's moustache. Contrary to popular belief, the phrase "Screw the Vancouver Canucks" does not appear anywhere within main body of the NHL rule book, and only three times in the appendix. In one of those quirky sports coincidences, every one of the 2,165 games Fraser ever officiated ended in a tie. Whenever you call in for a video review they always tell you that they're "experiencing unusually high call volumes", as if you don't know that they're just too cheap to hire more customer service reps. He owns a share of the all-time record for "most all-star game penalties called", with zero. He was steered into refereeing by a high school guidance counsellor who thought he might enjoy having every single decision he made for the rest of his life second-guessed by angry drunk people. The book contains 50 full color photographs, 47 of which are shots of small children in Maple Leaf jerseys crying. Prior to working the Nagano Olympics in 1998, he jokingly told Team Canada coach Marc Crawford that international rules barred players with jersey numbers higher than 90 from taking part in the shootout. During the 1986 playoffs, he once gave Al Secord a game misconduct penalty for humming "We Built This City" during the pregame warmup. When he called the infamous illegal stick penalty on Marty McSorley in the 1993 Cup finals, the Kings' enforcer told him "Wow, this is the worst thing that's ever happened to me that didn't involve Wendel Clark's fist turning my orbital bone into a pulpy shard-filled paste". Up until 1982, the entire NHL rulebook was written on the back of a matchbook from a pub in Raymore, Saskatchewan. He could never understand why fans in all 30 NHL cities always chanted “Bruuuuce” at him from the moment he stepped on the ice every night, because duh, his name isn’t Bruce. During instant replay reviews in the Toronto war room, NHL vice-president of hockey operations Mike Murphy refuses to rule on any disputed goal until he's been able to recreate it exactly using the bubble hockey game he keeps in his office. The book's foreword by Wayne Gretzky contains a bunch of really obvious typos and grammatical errors, but somehow Fraser failed to see them. The press box is way up there, huh? 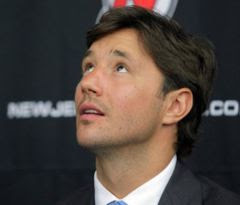 After dominating headlines during the offseason, Ilya Kovalchuk was back in the news over the weekend. In a shocking move, rookie Devils' coach John MacLean made his $100 million winger a healthy scratch for the team's game against the Sabres. The move has been debated heavily in recent days, with many observers questioning the strategy's effectiveness. General manager Lou Lamoriello has offered his support for MacLean's decision, although he refused to say whether he'd consider a similar move next week once he's head coach. But while Kovalchuk may be the highest paid healthy scratch of all-time, he's far from the first elite player to be singled out by management. Below are a few examples of other NHL superstars who found themselves in their team's doghouse at some point in their careers. January, 1996 - In an effort to get him to take on more of a leadership role, Bruins head coach Steve Kasper humiliates Cam Neely by benching him during a nationally televised game. To his credit, Neely responds positively the very next day by delivering a moving eulogy at the funeral of Steve Kasper. March, 1998 - Canucks coach Mike Keenan calls captain Mark Messier into his office to explain that, while the league's policy on gambling may be open to interpretation, he still needs to stop constantly trying to bet his teammates that they can't eat just one. January, 2004 - Enraged by Jason Spezza's inability to adhere to his defensive system, Jacques Martin is quickly restrained by his assistants after briefly displaying a facial expression. February, 2009 - After becoming upset that his team isn't listening to him in practice, Mike Babcock's attempt at sarcasm fails when the team responds to his taunt of "maybe you all need to turn up your hearing aids" by agreeing that that's a pretty good idea and turning up their hearing aids. December, 1987 - After chewing out franchise player Wayne Gretzky during a practice, Oilers' coach Glen Sather is accused by local media of doing the dumbest thing he could possibly do. He immediately vows to spend the rest of his managerial career proving them wrong. January, 2006 - Penguins coach Michel Therrien grows frustrated when star player Mario Lemieux repeatedly responds to criticism by saying "Hey, good point, maybe you should call up the owner and let him know." March, 1993 - Pat Burns shows that he doesn't play favourites when he briefly removes a slumping Doug Gilmour from the team's first line, although Gilmour does remain on the second, third, and fourth lines, both power play units, and the penalty kill. September, 2010 - Outraged by his off-ice behaviour, Edmonton Oiler management informs a devastated Nikolai Khabibulin that effective immediately he will be forced to be their starting goaltender. April, 1988 - Tired of his young franchise player's constant complaints about the quality of the roster, Red Wings general manager Jim Devellano angrily informs Steve Yzerman that being an NHL general manager isn't easy since it's not like other teams just call up and offer you star players for nothing. July, 1995 - In an effort to "send a message" to the rest of the team, you briefly demote Jeremy Roenick from the first line during a game of NHL 95 even though it makes your big brother call you a spaz while punching you in the shoulder. October, 2010 - The Islanders attempts to emulate the Devils by scratching their highest paid player prove fruitless when they are unable to figure out how to bench Alexei Yashin's buyout. December, 1995 - In a strong statement that still resonates to this day, the Montreal Canadiens make it clear to Patrick Roy that the franchise will simply not tolerate championship-calibre goaltending. It's not easy to be a young defenceman in today's NHL. With round-the-clock coverage on TV and online, it seems as if even the smallest gaffe is magnified and then broken down endlessly. The pressure is constantly on, and mistakes just aren't tolerated. What's a young defenceman to do? Luckily, there are dependable veterans like Chris Phillips and friends who are willing to serve as mentors to the next generation. Find more funny hockey videos at blogesalming.com. he'll actually try, I guarantee it!" One of the fun parts of being a hockey fan is keeping an eye on the record book. The game has a long and storied past, and it's always fun to see a player accomplish something special. Whether it's a record being broken or a milestone being reached, you never know when you're going to have the chance to witness a little bit of history. This year is shaping up to be no exception. Several marks have already been set, and many more are potentially on the way. Here's a collection of some of the records and milestones that fans should be watching for as the season plays out. Ottawa Senators - Are probably only about 10 or 15 games away from setting the all-time league record for most times being coached by Bryan Murray. Joe Thornton - The Sharks forward is closing in on several milestones this season, including 1,000 points, 300 goals, 700 assists, and four playoff wins. Ondrej Pavelec - Recently collapsed to the ice untouched while the action was 180 feet away, nearly breaking Daniel Carcillo's league record of 185 feet. Chris Osgood - Is only three wins away from joining the exclusive "400 career wins despite being completely terrible" club. Florida Panthers - Are just a dozen new subscribers away from setting a new all-time franchise record for season ticket holders, with a dozen. 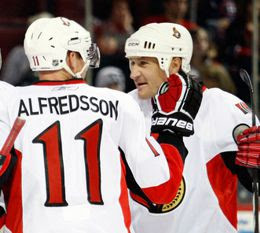 Daniel Alfredsson and Alexei Kovalev - Both players entered the season within ten points of 1,000 for their careers, which based on current rates of production will give Senator fans a chance to celebrate one of the games most important milestones once. Daniel Sedin - Is just 15 career points away from becoming the league's all-time leading scorer among players who look exactly like Daniel Sedin. Toronto Maple Leafs - Recently set the record for largest annual percentage increase in wins in the opening three weeks of the season, or would have, if division by zero were possible. Jacques Martin - The Canadiens bench boss will coach in the 1,200th game of his career in November. The occasion will be marked in a pre-game ceremony in which a bucket of paint will be dumped on the ice, after which fans in attendance will be encouraged to spend 60 minutes watching it dry. Kris Draper - Is just four assists away from joining the "200 assists" club, which would probably be more impressive if he wasn't also a member of the "wait hasn't he played in like 9,000 games?" club. Wade Redden - Recently became the AHL's all-time leader in career salary upon completion of his first shift. Martin Brodeur - The legendary goalie trails Patrick Roy's career saves mark by roughly 900, and will have an opportunity to break the record during a game next week when he is the only player the Devils can afford to dress. Sean Avery - Will break his own record for "most people simultaneously wanting to see a guy get punched in the face", presumably, since experts tell us that the global population continues to grow. Zack Stortini - Recently broke the career record for Corsi qualcomp score, which come to think of it is a little bit suspicious given that he's also the only person on the planet who knows how to calculate it. Patrick Kane - Recently set some sort of record for career shots, according to local bartenders. Roberto Luongo - Has a chance to reach the 300-win plateau late in the season, which by that point will be pretty darn good for a backup. Chris Pronger - Will not actually set any records or reach any milestones this season, but will somehow still wind up with all the other players' souvenir pucks. Voiceover: Welcome to tonight's coverage of every NHL game ever broadcast. Here's a montage of slow motion highlights set to non-threatening rock music. Now over to our in-studio host for tonight's game. Host: Hello everyone, I'm a little too excited to be here. With me is our panel of experts. Management: I'm the former coach and/or front office executive. Everything I say will be driven by grudges I still hold from my failed career. Player: I'm the recently retired player. I'm still friends with most of these guys, so I'll never say anything interesting. Media: And I'm the media guy. I will take every moment of the game and force it into a larger narrative for storytelling purposes. Host: Who are you picking to win tonight? Management: I'm picking the home team, because the visiting team fired me in 1983. Player: I'm taking both teams, because I don't see why everyone can't be a winner. Media: I'm taking the visitors, because I'm working on a story about concussions. Host: Makes sense. Let's send it up to the play-by-play announcer and the analyst. Play-by-play: Good evening. I'm a shameless homer, but will make a half-hearted attempt to disguise that if this is a national broadcast. Analyst: And I will say things you already know, five seconds after you yell them at your television. Play-by-play: We will now show you shots of both goaltenders, followed by a slow zoom on the referee who has his hand in the air. Analyst: Don't forget the shot of a coach staring into space. Play-by-play: Something interesting has happened right off the bat, although you didn't see it because you were trying to read the line combinations that we flash on the screen in three-point font. Let's go down to the guy we've stuck between the benches. What did you think of that play? Bench: I have no idea. You can't see anything down here and I'm terrified of being hit with a slap shot. Bench: I will now go silent just in time for the players around me to teach your children some new swear words. Play-by-play: Very educational. Let's send it back to the panel for the first intermission show. Host: Welcome to the first intermission show, where we ignore everything that's happened in the game so far and instead have the discussion we'd already prepared in advance. The home team has recently lost two games in a row. What fatal flaw would you randomly attribute those losses to? Management: I'm going to say a complete lack of intelligence on the part of everyone who has ever been employed by the franchise. Media: I'm going to attribute it to a lack of character, brought on by the disintegration of the traditional nuclear family. Player: I'm going to chalk it up to small sample size. Player: Just kidding. Let's go with character. Host: Now over to the highlight guy, who is in the same studio but has to stand ten feet away from us for some reason. Highlights: I resent you all terribly. Host: Back to you guys in the booth! Play-by-play: Welcome back. Here's a scoring chance … he scores! Let's bring in the former goaltender that we're legally obligated to include on every broadcast. Ex-goalie: That one was totally not the goaltender's fault, it was deflected in off a stick. Play-by-play: The goal came on a breakaway. Ex-goalie: Exactly. The shooter deflected it into the net using his own stick. Those are the hardest kind to stop. Play-by-play: Have you ever seen a goal that was the goalie's fault? Play-by-play: Let's send it back to the panel for the second intermission. Host: When you last saw us, we were telling you how terrible the home team was. Now that they've had one good period, let's pretend that never happened and instead go overboard in praising how well they're playing. Management: Here's a play from that last period, filmed from 15,000 feet above the ice. I will now scribble randomly on the screen with a magic marker. Player: Everyone tried really hard on that play and seemed to have fun. Host: Back to the action! Play-by-play: It's a 1-0 game, which means you're in for 20 minutes of plodding defensive trapping that we'll pretend is entertaining. Analyst: I will make vague references to a defensive "system" without ever explaining what that actually means. Play-by-play: And now a fight has broken out. I will attempt to win a Gemini by pretending to be completely horrified. Analyst: This is an overwrought comment about how nobody likes fighting, which you are unable to hear because the fans are cheering so loudly. Play-by-play: And there's the final buzzer. Analyst: This game went much faster than usual. Analyst: Here are tonight's three stars, which don't make any sense since we had to pick them with twelve minutes left in the second period. 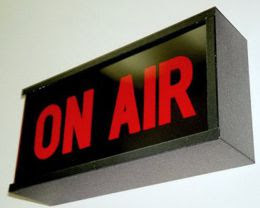 Play-by-play: And now let's send it back to the studio for the post-game. Host: Panel, before the game we all unanimously agreed that the home team would never win another game. Now that they've won, is it fair to say that it is in fact the visiting team that will never win again? Management: Not unless they hire some new blood to the front office. Hint hint. Player: I brought orange slices for everyone. Highlights: Die. All of you. Host: Thanks for watching everyone. Stay tuned to watch anchors narrate highlights of the game you just saw! While the action on the ice so far has been entertaining, most of the headlines generated by the NHL's opening week have come from off the ice. And thanks to the new reality of a salary cap world, they've been all about the bottom line. The Toronto Maple Leafs sent defenceman Jeff Finger down to the AHL, where he'll have a chance to line up against other big money demotions like Sheldon Souray and Wade Redden. Meanwhile, the New Jersey Devils weren't even able to ice a full lineup for two games because they couldn't afford to call up players due to the salary cap. While those stories made headlines, they weren't isolated incidents. Whether it's cap concerns or just old-fashioned penny pinching, everyone seems to have an eye on the balance sheet these days. And that's left many teams around the league scrambling to reduce costs any way they could in recent months. Here's a few examples of ways that teams around the league have been cutting budgets leading up to the season. Montreal Canadiens - Since the cost of repairing the damage to arena and surrounding areas resulting from riots after post-season wins are exorbitant, determine which player was solely responsible for those victories and trade him. Washington Capitals - Could try to offset increased spending by scheduling additional games to create extra revenue; investigate whether its possible to maybe play a few dates in May some year. Toronto Maple Leafs - Try to find some way to avoid paying those ridiculous entry level contracts to first round draft picks for a few years. 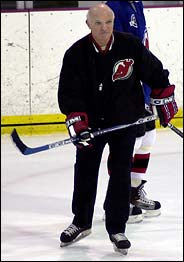 New Jersey Devils - Lay off the guy in charge of managing the salary cap, apparently. Calgary Flames - Due to outrageous costs involved in heating an arena during the winter, see if the league will let us play a game outdoors this year. Buffalo Sabres - Call up the cyborg manufacturing plant that created Tyler Myers and ask them to use cheaper materials for this year's model. Edmonton Oilers - Experiment with some radical new strategy we haven't tried in years, like winning. Detroit Red Wings - Reduce medical expenses by only targeting free agents who already qualify for coverage under Medicare. New York Rangers - Conduct a thorough examination of front office spending, such as figuring out why the guy who empties the wastebaskets was given a $3 million dollar contract from Glen Sather. Pittsburgh Penguins - Cut back spending on unnecessary luxuries, such as competent wingers. Phoenix Coyotes - Reduce IT costs by seeing if we can't find an owner who could get us some sort of discount on our Blackberries. Atlanta Thrashers - Save $2.4 million in cap space by walking away from any arbitration awards given to future Rocket Richard Trophy winners. Los Angeles Kings - Cut down on pre-game costs by having the national anthem performed by the first homeless guy we can find who has his own guitar. Philadelphia Flyers - Invite many of the best and brightest financial advisors from around the country to a team-sponsored symposium; lock the doors and have Chris Pronger steal all their lunch money. Ottawa Senators - Keep player compensation to reasonable levels by only offering incentive bonuses that are unreachable, such as for winning the Vezina. New York Islanders - Fire that guy who entertains fans during breaks by playing the slide trombone; ask players to start miming it instead. The NHL's opening weekend yielded a healthy dose of surprises, with arguably none bigger than the Toronto Maple Leafs. After last season's disastrous October that saw the team manage only a single win, the Leafs have already surpassed that with a 2-0 start this year. While it's obviously far too early to draw any meaningful conclusions about a team, there's no disputing that the Leafs have looked like a different squad over the season's first two games. And sources tell me that's no coincidence. Despite an offseason that seemed strangely quiet to many, the Maple Leafs have implemented several important changes that are paying off so far. I spent the last several days speaking to players, coaches, executives and team employees. And while none wanted to go on the record, they provided me with several important reasons why the Leafs seem so much better in 2010. Unlike last season, we've had several lucky moments when a shot that was headed for our net was deflected away at the last moment by an NHL-calibre goaltender. After two years, we all suddenly realized that when Ron Wilson says "left" he means his left, not your left; the entire game plan makes way more sense now. While everyone else was watching a fan pour water from various lakes onto the ACC ice as part of our opening night ceremony, our trainer was busy pouring ebola-infected water from the Don River into opponents' water bottles. Wisely scheduled the first two games of the season against teams that aren't very good. The players have been inspired by the franchise's classy treatment of demoted veteran Jeff Finger, which has included hiring a lookalike to sit in the dressing room and say things like "No seriously, I'm the real Jeff Finger and they didn't actually demote me, why are you all being so weird about this?" Finally decided to just pause the game, access the options menu, and move the difficulty slider down a few notches. The team bonded after being traumatized by the crushing pre-season disappointment of learning that Nazem Kadri was somehow not yet ready to score on every single shift as a teenager. We wanted to make sure that local media had a chance to use their "plan the parade" jokes, since those are unfailingly creative and hilarious. The players have been inspired by the story of Mike Zigomanis earning a spot in the starting lineup out of training camp, presumably as part of some sort of reality series that gives people who've never played hockey before a chance to make an NHL team. Don't use my name on this because I really want to stay anonymous, but I've been extra motivated to play well so that my dad doesn't start calling up random newspapers again. As the franchise's new captain, Dion Phaneuf successfully quells any dressing room dissent by saying "You make an excellent point and I respect your opinion, so it's a real shame that I have to order Wendel Clark to kill you now." When we have the puck in our end we've been focusing on simple plays like "off the glass and out", instead of last year's strategy of "turn around and take a point-blank slapshot at your own goalie just to make sure he's paying attention". The team has rallied around their new team slogan, "Go on out there and win one for the concept of small sample size". MLSE has long had a well-known "don't bother trying to win, since we sell out every game" policy; after hearing a rumour that one fan was actually considering cancelling his season tickets, the board of governors held an emergency meeting and voted to switch to "OK, go ahead and start winning" mode. Long story short, it turns out the whole thing was Chris Bosh's fault. Kris Versteeg has been giving us motivational pre-game speeches about how amazing it was to win the Stanley Cup as a member of the Chicago Blackhawks before trailing off, looking slowly around the dressing room, putting his head in his hands and sobbing deeply. The NHL saw a welcome new trend last month, when several teams sent actual players out to hand deliver season tickets to fans. The Bruins sent Nathan Horton and Milan Lucic out to surprise some loyal fans, and the Penguins had half their roster knocking on doors in the Pittsburgh area. Not as well publicized was the fact that the Toronto Maple Leafs have a similar program. They sent Luke Schenn and Tomas Kaberle door-to-door to deliver tickets to Maple Leafs season ticket holders who bought seats in the ACC's lower section. For more NHL videos, visit www.blogesalming.com. road lead directly to Boston. NHL fans have spent the past few weeks sifting through a steady stream of predictions from various experts and observers. In fact, virtually anyone with access to a keyboard has weighed in with their best guess as to what the upcoming season will hold. But does it really take any skill to predict the Alexander Ovechkin will score a lot of goals, or that Ryan Miller will record his share of shutouts? Is it really all that impressive to pick one of the half-dozen consensus contenders and label them the eventual champion? Doesn't anyone want to go out on a limb? Let's get specific. After reviewing this season's schedule, here's a selection of detailed predictions that will let you know exactly what to expect and when. October 9, 2010 - The Chicago Blackhawks raise their Stanley Cup banner prior to their game against the Detroit Red Wings. The moment is marred somewhat when Detroit third-liner Kris Draper surveys the rafters and comments "Wow, Chicago, you've won four Stanley Cups? Me too!" October 10, 2010 - The Phoenix Coyotes host the Boston Bruins in Prague, Czech Republic, enjoying a rare opportunity to play a home game in front of fans who have heard of the Phoenix Coyotes. November 6, 2010 - At the annual Hall of Fame game, thousands of fans show up in Toronto to express their appreciation for some of the very best players from hockey's history, and are deeply disappointed when Dino Ciccarelli shows up instead. December 2, 2010 - The Ottawa Senators host the San Jose Sharks. A returning Dany Heatley is badly shaken by the sound of 19,000 Senator fans booing and screaming death threats, until a teammate points out that they're actually just reacting to the appearance of a guy in the upper deck wearing a Leafs jersey. December 16, 2010 - The Maple Leafs make their first trip to Calgary since last season's blockbuster trade between the two teams. In an embarrassing mixup that he chalks up to force of habit, Dion Phaneuf accidentally takes a wrong turn on his way into the building, enters the Flames dressing room, divides it, and destroys their season. January 1, 2011 - The Penguins and Capitals meet in the Winter Classic at Heinz Field. A crowd of 65,000 fans who are used to watching Pittsburgh Steelers games sit in confused silence whenever Alexander Ovechkin takes the ice, as they're not used to watching a funny looking foreigner who isn't kicking something. January 23, 2011 - The Flyers and Hawks meet for the first time since the Stanley Cup finals, which featured several insulting comments by Chicago players directed towards Chris Pronger. Pronger takes the high road and has a bouquet of flowers delivered to the Chicago dressing room, leading several Blackhawk players to admit that they may have been wrong about him, confess their admiration of his sportsmanship, and briefly wonder why the flowers seem to be ticking. February 20, 2011 - A new tradition is launched with the first annual Hockey Day in America. The event features a day-long tribute to all the places in the United States that truly love and respect the sport, from Minnesota all the way to Eastern Minnesota. February 20, 2011 - Meanwhile, the Flames and Canadiens meet north of the border in the outdoor Heritage Classic. The event brings back all sorts of great memories of the 1989 Stanley Cup series between the two teams, right up until PK Subban casually mentions that he was only born a few days before all that happened and you suddenly feel very old and decide to go lie down for a while. March 2, 2011 - The trade deadline passes. Maple Leafs general manager Brian Burke keeps his promise to not ask Tomas Kaberle to waive his no-trade clause, in the sense that throwing a burlap sack over someone's head and shoving them into a cargo plane bound for Vancouver is not technically "asking". 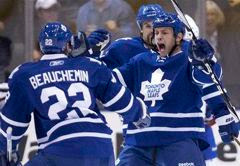 April 10, 2011 - The NHL regular season concludes. You look back at how much optimism your favourite team had in early October, laugh softly to yourself, throw an empty bottle of scotch through your TV screen, and start working on your 2011-12 season preview. Take the Quiz: How will your team do this season? just concentrated on eating all the paste. For hockey fans, the wait is over. Training camp is done, final rosters have been announced, and the start of the season is just a days away. Very soon, we'll start to separate the contenders from the pretenders. But what if you're the type of fan who doesn't like suspense? What if you can't be bothered to watch 82 games just to find out whether your favourite team will be any good this year? You're in luck. By taking the quiz below, you can find out right now whether your team has what it takes to succeed. 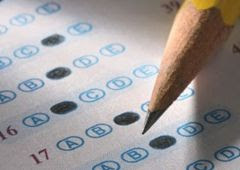 Simply grab a pen, circle the answer to each question that best applies to your team, and then consult the answer key at the end. Spoiler alert: Don't read any further if you want to be surprised. What is your team's official marketing slogan for the coming season? a.) "Come and watch us on our quest for the Stanley Cup." b.) "Win or lose, you'll always see an honest effort." c.) "All season tickets are non-refundable." d.) "Hey, as long as everyone has fun and nobody gets hurt there's really no reason to keep score, right?" During an exhibition game, you notice your team's coach is using one of those fancy new tablet computers behind the bench. When the camera zooms in on the screen, what would you expect to see him doing? a.) Drawing up a detailed play that's specific to the current personnel and game situation. b.) Reviewing video of a play that took place earlier. c.) Googling the phrase "How does 'icing' work?" d.) Posting his resume online. a.) "Alexander Ovechkin without the mercy"
b.) "Chris Pronger without the mean streak"
c.) "Martin St. Louis without the size"
d.) "Vesa Toskala without the limbs"
a.) "The presumptive Stanley Cup champions"
b.) "The dark horse contender"
c.) "The complete and utter travesty of a team, an embarrassing collection of unskilled impostors, seemingly lacking in even the most basic human capacity for shame"
How often does your team take a "too many men on the ice" penalty? a.) Never. The coaching staff has enforced an unshakable team-wide commitment to discipline. b.) Occasionally. But only because of confusion caused by those two all-star forwards being identical twins. c.) Often. Your players have difficulty with complex concepts, such as "six". d.) Never. The league has ruled that, due to their talent level, it is technically impossible for your team to ever be using "too many" players. a.) "That we won it all -- nothing else will be acceptable." b.) "That we always gave it everything we had, even if it was in a losing cause." c.) "That we finished near the top of the league in ties." d.) "At the end of the season? You should probably ask somebody who'll still be employed here." a.) "Then again, I'm really just stating the obvious here." b.) "Of course, that's only if they're able to stay completely healthy." c.) "This concludes my demonstration of the sort of thing people say when they've suffered severe head trauma." What is currently hanging from the ceiling in your team's dressing room? a.) A replica of last year's championship banner. b.) An inspirational quote about never giving up during difficult times. c.) Streamers, balloons, and a sign reading "Congratulations on winning a faceoff". Scoring: Total up your answers, then check below to find out how your team did. Mostly a's: Plan the parade! Mostly b's: Get ready to enjoy the ups and downs of an interesting season. Mostly c's: Oh well, at least you can look forward to a top five draft pick. Mostly d's: Oh well, at least the Bruins can look forward to a top five draft pick. The good: Just like every other team, will be tied for first place when the puck drops on opening night. The bad: Will somehow be eight points out of a playoff spot by the next morning. What to watch: Are expected to trade Sheldon Souray, which will be great since the bag of pucks they currently use at practice needs replacing. The good: Eastern-based hockey media agree that the team has an excellent lineup, featuring Shane Doan, Ilya Bryzgalov, and, um… you know, all those other guys. The bad: There's absolutely no evidence that their owners know anything about hockey. What to watch: Unless it's the playoffs, the guy at the sports bar asking you to "toss the snake" may not actually be a Coyotes fan. The good: Have promised their long-suffering fans that they'll play half of their games in other cities this year. The bad: The departure of Marty Turco is expected to drain the self-confidence of forwards who were used to practicing against him. What to watch: The inspirational Mike Ribeiro, who continues to suit up despite suffering an apparent career ending injury on every third shift. The good: Continue to exist, you're pretty sure now that you stop and think about it. The bad: Their new starting goalie once lost his job to Carey Price, so how good could he be? What to watch: The confused look on their fans' faces when they see Blackhawk fans celebrating with that big weird trophy thing. The good: Shocked the hockey world last year by achieving something few observers had believed possible. The bad: It was losing to the Sharks in a playoff series. What to watch: Coach Joe Sakic, who modestly insists that you call him "Joe" instead of "Mr. Sakic" and actually seems to get kind of touchy about it after a while, come to think of it. The good: Refused to meet Ilya Kovalchuk's contract demands in free agency, greatly reducing the chances that you'll be forced to stay up to watch Stanley Cup finals games on pacific time. The bad: In hindsight, Barry Melrose pretty much ruined the mullet for everyone. What to watch: Drew Doughty, the current consensus pick the win the Norris, the Hart, the Vezina, and the Biletnikoff. The good: Don't have any cap problems, unless you count Ryan Getzlaf's refusal to cover up his bald spot. The bad: Will be without their #1 defenceman, Scott Niedermayer, as well as their #2 defenceman, Scott Niedermayer's beard. What to watch: The "flying V" strategy from the Mighty Ducks movies would be called offside every time, which really has nothing to do with Anaheim but has always sort of bothered me. The good: The departure of Derek Boogard means the dressing room stereo can finally be used for pregame music again, instead of all those damn Stephen Hawking audiobooks. The bad: A recent exhibition game produced the first non-sellout in the franchise's ten year history, proving conclusively that US expansion can never succeed. What to watch: Josh Harding if he's standing anywhere near you, because you know that lightning strike is on its way. The good: Consistently choose really good teams to lose to in the first round. The bad: Shea Weber slapshots have been known to go through the net, end boards, several rows of stands, and crucial load-bearing arena walls. What to watch: Coach Barry Trotz, an honourable man who would never fail to stick his neck out for his players if he had one. The good: Are a team that absolutely nobody cares about, so you can safely ignore them when writing a preview. The bad: I mean, you still need to put some text in there. You can't just leave a blank space, people would notice that. But you can write pretty much anything you want because nobody will read it. What to watch: Note to self, Post editors may be getting suspicious of the embezzling. Find a temporary new source of funding for lavish gifts for the mistress. The good: In last year's first round series against the Avalanche, silenced critics who called them playoff chokers by scoring an NHL record five game-winning goals. The bad: It's their fault that you're able to have an intelligent conversation with your wife about the pros and cons of the color teal. What to watch: Dany Heatley makes his return to Ottawa on December 2, giving Senator fans a chance to boo somebody out of the building other than Daniel Alfredsson during every Leafs game. The good: They kept their own first round pick this year, which is great news since they will be terrible. The bad: They'll also have the fourth round pick of whichever team they panic and trade Jarome Iginla to. What to watch: Jay Bouwmeester, the greatest postseason performer in hockey history as far as anyone knows. The good: Chris Osgood has inspired a generation of hockey players by winning three Stanley Cup rings despite being born without the ability to be an adequate NHL starting goaltender. The bad: They finally got the old man smell out of Chris Chelios' locker, and then along comes Mike Modano. What to watch: Mike Babcock's angry face, if you need to get rid of some hiccups. The good: Saw their 50-year rebuilding plan pay off a whole season ahead of schedule. The bad: Marian Hossa may be a little fatigued, since he's had about fifteen total days of offseason in the past three years. What to watch: Patrick Kane doesn't seem to have gained any arm strength this offseason, even though whenever you ask him how he spent his summer he says something about lots of 12 oz curls and then high fives you. The good: Now that he's been stripped of the captaincy, Roberto Luongo will no longer spend the majority of every practice working on his ceremonial faceoff technique. The bad: After last year's Stephane Auger controversy, referees can no longer try to "get" Alex Burrows during games, and will now have to resort to running him over in the parking lot. What to watch: The team enjoys a spirited rivalry with the Blackhawks, in much the same way that cake enjoys a spirited rivalry with a fat kid on his birthday.